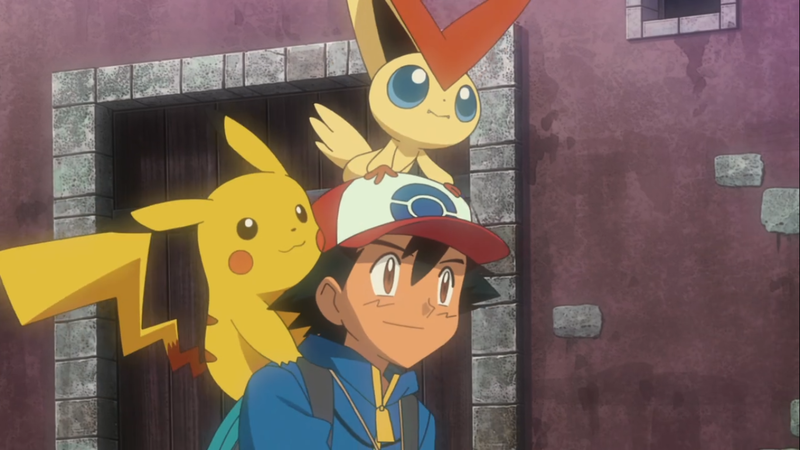 Satoshi carrying around Pikachu and Victini through Eindoak Town. What mysteries does this place hold for them? White – Victini and Zekrom and Black – Victini and Reshiram, known in Japan as「ビクティニと黒き英雄ゼクロム」(lit. “Victini and the Black Hero – Zekrom”) and「ビクティニと白き英雄レシラム」(lit. “Victini and the White Hero – Reshiram”) are the 14th overall Pokemon film and the first Pokemon movie in the Best Wishes subseries. The confusing notation comes from the unique distribution of this film. The Pokemon Company aired two versions of the film in theaters, allowing viewers to support the version they liked better much like the actual Pokemon games themselves. The pair of films released in Japanese theaters on July 16, 2011, while Victini and the Black Hero – Zekrom premiered in American theaters on December 3 that same year, with Victini and the White Hero – Reshiram airing on Cartoon Network on December 10. Though the films are technically different, they showcase the same overarching plot and most of the animation across both films. The differences come from the appearance of certain Pokemon versus others, and more importantly whether Satoshi and the primary antagonist, Dred, are supported by Zekrom or Reshiram respectively. In terms of raw time, the duration of differing content totals up to be about 20 minutes of each film’s one and a half hour run time. Also of note these are the first Pokemon films since 2002’s The Guardians of Alto Mare: Latias and Latios to air in American theaters. 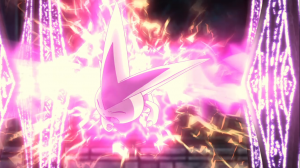 Does Victini and the Black/White Hero – Zekrom/Reshiram (hereby Victini) provide a warm welcome for the Best Wishes series or does it turn a cold shoulder to fans? Let’s find out. Each film opens up by following a man named Dred Grangil (English, Damon) travelling to two distinct locations, tracking down the settlements of the far-spread People of the Earth (“Earth” is replaced by “Vale” in English). In Zekrom, Dred travels through a desert, while in the Reshiram, he travels to the cold arctic. Dred tries to convince the leader of each of these groups to help him reclaim their homeland, the land of the People of the Earth. In both versions of the film, the leaders refuse to give Dred their aid, but just as Dred prepares to leave a disaster threatens to befall the settlements. In Zekrom, a herd of Bouffalant stampede as they run away from a twister. In Reshiram, an iceberg shatters, threatening to destroy the settlement. Dred calls forth Reshiram (in Zekrom) or Zekrom (in Reshiram) to stop the settlements from being destroyed before returning back to his home of Eindoak Town. Meanwhile, Satoshi (Ash Ketchum) and his travelling companions Iris and Dent (Cilan) are also making their way to Eindoak Town. Along the way, they see a couple of Deerling in danger of falling off a cliff. Satoshi goes out to help them, but the rock footing breaks underneath him as he pulls the Deerling up from the ledge. Before Satoshi falls off the cliff, Victini who was hiding nearby grabs his leg and imbues him with a strange power. Thanks to this power, Satoshi leaps hundreds of feet into the air, landing next to a set of ruins on an opposing cliff. Satoshi tells Iris and Dent to meet him on the other side. Satoshi eventually finds his way back to Iris and Dent, and the three meet with Dred, who guides them to Eindoak Town proper. At the town, the three of them part ways with Dred and register for the town’s yearly festival Pokemon battle tournament. Satoshi successfully wins round after round even after Iris and Dent are eliminated. Eventually, Satoshi has to face off against Karita (English, Carlita), a young girl who is Dred’s younger sister. Satoshi’s Scraggy uses a headbutt attack, but the attack bounces harmlessly off of Karita’s Hydreigon. Seeing Scraggy in a pinch, Victini decided to share some of its power with Scraggy, giving Scraggy a massive power boost that allowed Satoshi to take victory over Karita. After their battle, Karita and her mother, Janta (English, Juanita) ask Satoshi whether he has a Victini aiding him. Satoshi at first doesn’t understand what they mean, but eventually they manage to coax Victini out of hiding by offering it some macarons. Happy that they found a new Pokemon friend, the whole lot of them have Victini guide them around the town. However, as they reached the outskirts of Eindoak Town, Victini is suddenly hurt by a magical barrier preventing it from leaving the town. Victini, suddenly frightened, flies away. The group go to find Victini, and eventually find it in a garden near the ruins of a structure called the Sword of the Earth, the ruins that Satoshi was lost in earlier. There, they meet up with Dred once more. The group make amends with Victini and all the Pokemon of the garden plus the group’s Pokemon and Victini play together. 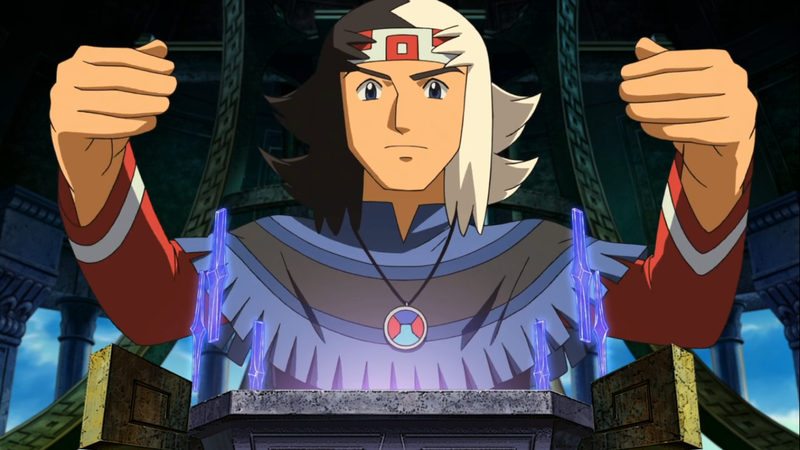 While the Pokemon played together, Dred and the Mayor of Eindoak Town take them inside a library in the Sword to explain to Satoshi and his friends the origins of Eindoak Town. In the ancient past, the People of the Earth lived in a different location called the Kingdom of the Earth. The twin sons of the King of the People of the Earth reared two dragon Pokemon, Zekrom and Reshiram, and became known as the Hero of Ideals and the Hero of Truth. One day, the two sons had a fight about their beliefs, bringing ruin to the kingdom, and wrongly using the power of the Dragon Pulse, a power that can either bring life or ruin to the land. To stop the rampaging Dragon Pulse, the King asked Victini’s help to unearth the Sword of the Earth and stab the head of the Dragon Pulse to prevent its spread. The two succeed, planting the Sword in modern day Eindoak Town, but it cost the King’s life and Victini’s freedom from wandering outside of the Sword. The two sons, ashamed of themselves, sealed away Zekrom and Reshiram vowing never to use their powers inappropriately again. In a private meeting later with leaders of the scattered People of the Earth and the mayor, Dred reveals that he uncovered the secret to reviving the desolate land where the original kingdom stood. He found Zekrom/Reshiram (depends on the film version) deep within the Sword, and thanks to their power learned how to move the Sword. Believing him, the leaders decide to assist Dred, as do Satoshi and his friends. However, Dred forcibly detains Victini and begins to drain its power to lift the Sword. Seeing his new Pokemon friend in pain, Satoshi tries to stop Dred, but cannot fight against his psychic-type Pokemon. They are detained in a lower floor of the Sword, where Satoshi feels something calling to him. He enters deep into the ruins of the Sword to find Zekrom/Reshiram (whichever one Dred didn’t recruit), who agree to help him save Victini. Zekrom and Reshiram begin to fight, as does Satoshi and Dred. However, from the place where the Sword originally rested, the ancient Dragon Pulse began to flare out of control once more, spreading across and ruining the land. The dragons, realizing their mistake, strike an alliance and convince Dred to stop the Dragon Pulse with the Sword. The Dragon Pulse proves too strong for the two dragons to fend off, and the pulse consumes the Sword, causing it to fly away towards space. Though everyone else started to evacuate, Victini could not leave due to the ancient barrier erected by the king. Satoshi, unwilling to leave Victini, tries to stay with it and destroy the pillars creating the barrier, but to no avail. Rapidly losing oxygen and beginning to feel his body freeze, Satoshi apologizes to Victini that he couldn’t free it. Saddened by its friend’s pain, Victini flares up and unleashes its power, destroying the pillars and subduing the flow of the Dragon Pulse, causing the Sword to return to Earth. Guided by Zekrom and Reshiram, the sword falls safely on top of the source of the Dragon Pulse, sealing it away once more. 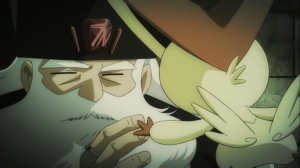 At the end of the film, Satoshi laments that Victini might have died, and begins to cry. He throws a macaron he was going to share with Victini in frustration, but the macaron stops mid flight. Victini unveils itself from invisibility, alive and well and now free to roam the world again thanks to Satoshi. After parting ways with everyone else, the gang once again hits the road. 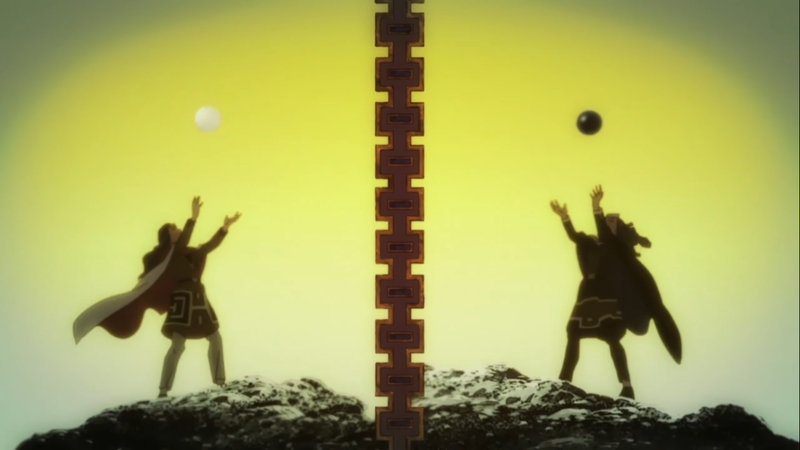 The Hero of Truth (left) and the Hero of Ideals (right) holding above their heads the orbs of Reshiram and Zekrom respectively. Obviously, the Victini films are the first (and thus far, only) films to try the dual version showing gimmick. It’s an interesting nod to the way the Pokemon video games handle their releases, with each major Pokemon title release coming in pairs that give the same overarching experience, but featuring different Pokemon. However, fans of the video games, specifically Pokemon Black and White versions, will see that the films also pay note to the Heroes of Truth and Ideals, two persons mentioned in the games. This is the first time since Mewtwo Strikes Back! that lore and events from the game are directly referenced by the films. Though the roles of the Heroes of Truth and Ideals are considerably smaller than the role Mewtwo took in its movie, it’s still nice to see the games referenced. The King of the People of the Earth says his last goodbye to Victini before he passes away. Speaking of Mewtwo, viewers of the Pokemon films will know that though the franchise is kid-focused, the movies cover some dark things when looked at from the perspective of an adult. Whether it’s the ethics of cloning, using Pokemon as tools of war, enslaving Pokemon, or the apocalypse, the Pokemon movies always seem to remind us of the hard stuff even in this strange universe filled with adorable creatures. This time, Victini hits us with what I think is the cleverest presentation of a dark theme we’ve seen yet. A thousand years ago, the titular Pokemon Victini was accidentally trapped in Eindoak Town by the powers of the old King of the People of the Earth. He asked for Victini’s help to seal the ancient Dragon Pulse, but forgot to remove a seal that kept Victini trapped. In a flashback, Satoshi sees through Victini’s eyes a timelapse view of its thousand years trapped in the town. Normally, Pokemon media show off the immortality of these legendary Pokemon as a great boon, but here it’s a little bit different. This short flashback glimpse allowed us to see that Victini’s immortality acted more as a curse than as a blessing. Thanks to its immortality, it suffered through a thousand years, trapped in the same place lonely and afraid to interact with people. The directors easily could have shown us explicitly the loneliness Victini felt on screen, but the brief glimpse stimulated our imaginations. After all, the imagination can conjure things that impact our emotions more strongly than any man-made picture. Dred takes command of the control mechanism that allows the Sword of the Earth to fly. Unfortunately — despite Victini’s character showed a surprising amount of depth despite the Pokemon not speaking a word of human language — our movie’s antagonist has very shaky reasons for doing the things that he did. In this film, Dred belongs to a race of people known as the People of the Earth. This race of people are very clearly modeled after Native Americans and Dred’s motivation focused upon reclaiming the ruined land of the People of the Earth. Between their garb, their name (People of the Earth? Really? ), and Dred’s whole motivation, I couldn’t help but cringe at how racist it felt. I’ll grant that this is nowhere near as offensive as some other portrayals of Native Americans (T.Hawk from the Street Fighter game series anyone? ), but I’d be lying if I said that it didn’t affect my impressions of the film. It’s pretty egregious. Victini is captured in a containment device created to channel Victini’s power into the Sword of the Earth’s flight system. But back to Dred. There’s a simple reason he’s a weak villain: It’s that he isn’t really a villain at all! The entire film, we’re given exposition saying that Dred’s motives are pure and noble. He just wants to restore the desolate land of the People of the Earth back to a lush wilderness from when it was ruined a thousand years ago. He’s shown as a man with strong ideals, but at the same time friendly to humans and Pokemon alike. We saw Dred at the beginning of Victini and the Black Hero: Zekrom pick up a wounded Blitzle and carries it back to a nearby camp for treatment. He guides Satoshi and his friends to Eindoak Town’s square since the group was lost. And I’ll stress again: he only wishes to restore a damaged landscape. Dred is set up (other than his name) to be a good, wholesome character. So when Dred suddenly captures Victini and forcibly drains its energy, despite it obviously inflicting suffering, and then attacks Satoshi with his Pokemon when Satoshi tries to rescue Victini, things start to make no sense. There’s a large disconnect between how Dred was acting throughout the film and his sudden 180 in personality at the climax of the film. This isn’t the first time we’ve seen this kind of villain in a Pokemon film. Remember Butler from Jirachi: Wishing Star of the Seven Nights? He was also another villain that wasn’t actually a villain, but had misdirected motives. We saw Butler do a 180 when he decided to finally “become evil” but we already knew from the get-go that Butler has a plan that he’s willing to sacrifice anything for to accomplish. Dred on the other hand certainly wanted to restore the original land of the People of the Earth, but I’m certain he didn’t want harm to come to anybody or even to Victini. Yet he traps Victini, attacks Satoshi, imprisons the group deep within the Sword of the Earth, and generally does bad-guy things. And the problem is we’re expected not to hate him by the end of the film. In the end, he shows deep remorse for doing everything that he did since he knew nothing of the destructive powers of the Dragon Pulse and why the Sword was locked away in Eindoak in the first place. That’s fine; I get that. But Dred, you had the most inconsistent personality of any Pokemon villain we’ve seen yet. In the end, Victini starts off the Best Wishes series of films with a bunch of interesting new ideas. Between the two versions of the film, the connection to the video games, and the surprisingly strong characterization of Victini, it looked like it could’ve been a promising film. But it unfortunately tripped before reaching the finish line thanks to an incredibly weak villain and questionable political correctness.